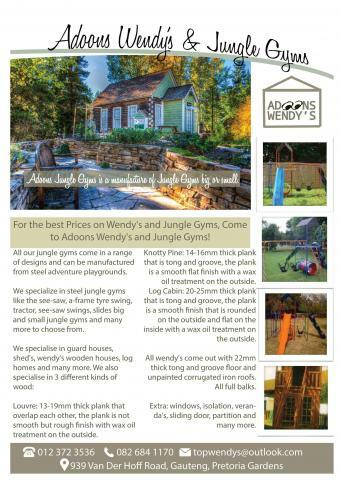 For the best Prices on Wendy's and Jungle Gyms, Come to Adoons Wendy's and Jungle Gyms! All our jungle gyms come in a range of designs and can be manufactured from steel adventure playgrounds. We specialize in steel jungle gyms like the see-saw, a-frame tyre swing, tractor, see-saw swings, slides big and small jungle gyms and many more to choose from. Louvre: 13-19mm thick plank that overlap each other, the plank is not smooth but rough finish with wax oil treatment on the outside. Knotty Pine: 14-16mm thick plank that is tong and groove, the plank is a smooth flat finish with a wax oil treatment on the outside. Log Cabin: 20-25mm thick plank that is tong and groove, the plank is a smooth finish that is rounded on the outside and flat on the inside with a wax oil treatment on the outside. All wendy's come out with 22mm thick tong and groove floor and unpainted corrugated iron roofs. Extra: windows, isolation, veranda's, sliding door, partition and many more.